2. This software is compatible with Windows 7 / 8 /10 with USB port. 3. After download, please double click the file (doorbell.exe) to start installation. 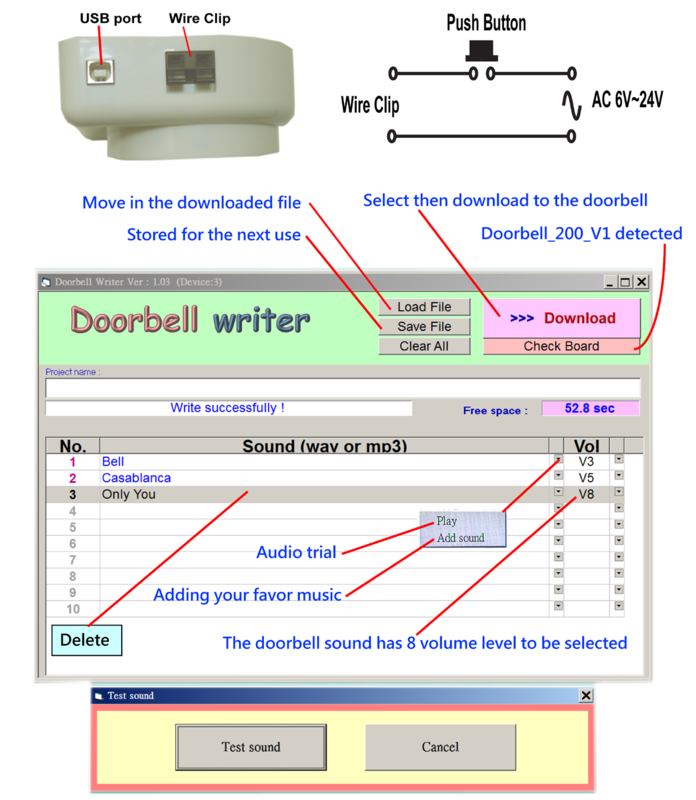 Follow the on-screen prompts to complete the installation of the Doorbell writer program onto your computer. 1. Remove the battery cover of the Doorbell. 2. Install 3 "AA" size (1.5V) batteries into the battery compartment and replace the cover. 3. At the first time after connecting the Doorbell to PC's USB port via USB cable, Windows will find new device and install the device driver automatically. 4. Connect AC 6V ~ 24V to the wire clips on the top of the Doorbell through a push button. 5. Press the push button to trigger the MP3 Doorbell for playback, one more press to start playing the next song.